I consider myself a pretty stoic person. Well, actually I know better because I live on the inside of my walls. But I'm generally pretty good about keeping up that appearance. Even my wife buys it, and she knows me better than anyone else. 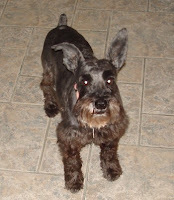 So I have to admit that it surprises me how much I have been hurt by the death of my Miniature Schnauzer, Teddy. I've only had the little guy since August of 2007, so that shouldn't be enough time to get all that attached, right? Teddy spent most of his life, nearly twelve years, with some old military friends of ours (the wife is Navy, the husband is Army). They have a couple of acres near Jacksonville, Florida where Teddy was mostly an outdoor dog. But as Teddy started to get older and they were both deployed elsewhere, we agreed to have him come live with us so he could retire and live out his days indoors, in ease and luxury. Anyway, Teddy quickly worked his way deeply into our affections when he arrived here. He was extremely good-natured, lovable, and smart, with a gentle disposition. He has been my constant companion, spending all day with me here in my home office, and giving me a great excuse to get up from the computer screen during the work day and go for walks outside. Several weeks ago Teddy was diagnosed with Cushing's Disease, and though we tried treatment, it turned out that he also had several other conditions that made him deteriorate rapidly. He quickly went from what seemed like a fairly normal elderly dog to an ill-looking skin-and-bones mess that could barely stand up or walk around. So we made the hard decision to go ahead and euthanize him, to minimize his suffering and mercifully hasten what would otherwise be a senselessly painful final few weeks of life. I took Teddy to the vet for the last time yesterday, and was present when he was given the lethal dose. The vet was very gentle with the procedure, and Teddy passed quickly and painlessly. I brought the body home and buried him under the biggest tree in our yard. I had already dug the hole a few weeks earlier, and I'm glad I did because otherwise an already unpleasant experience would have been much worse. Being there as the last breath left my little canine friend, carrying his body out into the yard and putting him in a hole, burying him on a cool and rainy day -- you would think that these parts would be difficult. But looking back, it was like I was on autopilot, doing what needed to be done without stopping to consider the pain of it. The hardest part was coming back into the house, hoping to hear the jingling tags on his collar, expecting to be greeted at the door by excitement beyond compare like so many times before -- but being greeted by silence. Deep, penetrating silence that cut my heart like a knife. That silence has been my constant companion since yesterday morning when all this happened, and I can't seem to shake the horrible sense of loss and pain I feel inside. If you're like me, at this point you're probably reading this and thinking "Get over it man, it's just a dog." And I understand that. I've had pets all my life, and this is just part of what goes along with getting attached to them. I'm sure the pain will subside over the next few days and weeks. But I guess I'm just struck by how strongly this whole thing has unexpectedly affected me and my stone cold unfeeling self. I feel like I should be using this compassion on people, and important problems in the world -- not on the loss of one little dog. But knowing that and actually experiencing it are two different things. This experience is certainly making me feel more empathy towards other people, and reminding me to comfort them in their pains and struggles, even over little things that I may not understand. I'm so often driven by logic and reason, and as terrible as it sounds, sometimes wonder if I even still have a heart at all. Now I know I have a heart, because it's broken. In my previous post, I mentioned that despite feeling good about my decision not to attend Sunday morning church services, there are still a few concerns I have that I think are worth mentioning. I was raised with a strong sense of social responsibility. That is to say that as a general principle, anything I'm engaged in that involves community should cause me to endeavor to put more into it than I get back from it. You can apply this principle to personal relationships, small groups of friends, clubs or organizations, and continue upward into local and state government, national government, and finally all of mankind. I think that most reasonable people could agree that if everyone truly abided by this principle, the world would be a better place. I like to think that by and large, I have done a pretty decent job of abiding by this principle. 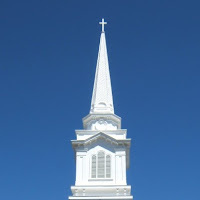 It is with this in mind that I admit the first concern I have about not attending the big church: Am I benefiting from the work and sacrifice of others, who are part of the institutional church, while putting nothing back into it myself? My wife is currently attending an intensive two-year through-the-Bible study that has been amazing and life-changing for her. I'm not sure who wrote and distributed the materials, but it is sponsored by and held at the big church, at a fairly minimal cost to us. I've mentioned before that even the small group that we attend, and consider our "church", is affiliated with the big church. I very much appreciate the fact that the big church does not micromanage this in any way, or mandate any aspect of the small group. Ours is attended by people who attend other churches, or no church at all, and the big church is perfectly fine with this. They offer general help and guidance upon request, but seem willing to trust the leaders of the small groups to use their own judgment about what the members need. Most of the community outreach projects that we take part in are either started by, or supported by, the big church. They are great about using things like e-mail chains to make people aware of service opportunities or special needs that arise. If there were no centrally located church organization, I'm not sure exactly how much of this stuff we would find out about, and how much of it would get done at all. So are we being leeches by benefiting from the work of others in some way, while putting nothing back in? Comments are welcome, and don't worry about hurting my feelings. As I've already mentioned, I'm sincere about the questions I'm asking. I'm just trying to find my way to the heart of Jesus the best I can. If I've gotten way off track, I'm open to correction. At this point, this "not going to church" thing is not a hill I'm willing to die on. I think it was Good Friday when my wife said to me, "Hey, it's Easter time. Do you want to go to church on Sunday?" And I said, "Sure, why not?" See, the thing is, we haven't been attending Sunday morning services for the last few months. I discussed this on a recent post. This is a decision that both myself and my wife have been quite comfortable with. Technically, the small group we attend is affiliated with this larger church. It's a very nice church. Good, solid Bible teaching, emphasis on missions and community outreach, and always a rad and super-tight music thing on Sunday morning. They have cool videos and a great sound system. As far as Sunday morning church goes, this seems about as good as you'll find anywhere around this area. Anyway, after the service we discussed how we felt about it, and decided we both still very much like our decision not to attend Sunday morning church. We read about ten times as much Scripture and Bible-teaching on our own as what we hear from the preacher/teacher guy during a monologue. We aren't really into the music there as an expression of what we consider "praise" or "worship" to the Lord. We give away more money than a tithe or offering would amount to, and we know for certain that what we give is going directly to meet needs in our community and around the world. We are actively involved in the messy lives of all the real, actual people we can handle. When additional service opportunities are brought to our attention, we gladly donate our time and energy to those. And the list goes on and on. I'm fully aware of the objections that people can and do raise to this approach we're taking. I'm not defensive in addressing those, and do still have a few lingering concerns that I'll address on a later post. In the end, both my wife and I chuckled at the notion -- "Maybe we'll attend church only on Easter and Christmas. We'll be those kind of Christians." That statement is ironic, and bears no resemblance to what it would have meant to either of us just a few years ago. Someday I'll have a strong prayer life. For now, it seems like I spend a lot of my day thinking about the Lord, and pondering things, and communicating with Him more by feelings and thoughts and experiences than by words spoken aloud. I'd like to have a dedicated prayer closet, with a couple of well-worn places where my knees have been. I'd like to see miraculous transformations all around me -- the result of spending serious time wrestling with God and winning. Someday I'll really dig in and read my Bible, and understand it all, and be able to apply it all practically. For now, reading certain parts seems a chore, and I just can't seem to get one of those disciplined daily-reading plans off the ground. So I mostly jump around, or stumble randomly into reading a chapter or section that seems relevant at the moment, and sounds vaguely familiar. Someday I'll fulfill my creative potential -- take all the talents the Lord has given me out of storage, and exercise them again. I'm sure they're still in there somewhere. For now, I mourn daily the utter dearth of imagination that I've suffered in the last several years. Artistic block is one thing; the apparent death of half my brain seems like quite another. Someday, I'll be the kind of husband my wife deserves -- loving, romantic, strong, thinking only of her and her well-being. For the moment, I'm selfish, and never seem to be able to express my love for her like I know I should. There never seem to be enough hours in the day to do all the wonderful things with her that I imagine I could. When we have free time, I look at her, and she looks at me, and we shrug and wonder if we're boring. We're deeply in love, more with each passing day -- but maybe we should be doing something more. Someday, I think we'd like to be missionaries in a far away land. I have friends that have done it, and I comprehend the beauty and wonder of watching people in other cultures hear the Gospel for the very first time, and of seeing them come to know the Lord with an innocence and sincerity that sounds refreshing to my weary, cynical American mind. 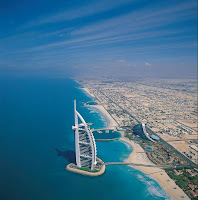 For now, I have obligations that keep me where I am, and I'm content to be where I find myself. Probably not the kind of obligations you're thinking, if you think I'm working to acquire more stuff. It's not that. These are more along the lines of people that are relying on me, and I'm okay with that. I'm honored to be a critical part of the support structure for the people that I love. Someday I'll exercise more and get in great shape, and floss daily, and help little old ladies across the street, and love my neighbor. Right now, I'm just too busy with, you know, life and stuff. I'm sure grateful for Jesus, and for God's grace. Grace covers me where I am -- right here, right now. Someday I'll write the perfect blog post. For now, this one will have to do. Growing up, I was in Cub Scouts, then Webelos, and finally Boy Scouts. Though I never really excelled in these or became highly decorated, I did have a lot of fun in them. One of the most fun activities I remember was going on camp outs. For a growing boy, there was something magical about packing up some survival gear, a tent, and a bunch of snacks, then heading to the deep woods for a few days with a fraternal order. On one particular camp out, my next door neighbor Greg and I were introduced to something called a "snipe hunt". Snipes, we were told, are small birds that live in the forest, and dwell mostly on the ground. The idea was that one group of boys would spot the snipes, and then chase these birds directly toward us. We had a bag for catching the snipes, and were supposed to scoop them up as they came our way. In case you haven't heard of this or figured it out by now, the whole thing is a ruse. 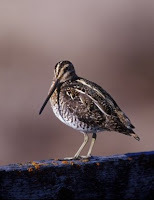 While there apparently really is a bird called the snipe, there weren't any snipes anywhere near our camp grounds. Ultimately, the idea was to lead a couple of young newbies out into the deep woods, then tell them to "wait here for the snipes and scoop them up", then to head immediately back to camp and sit around laughing, wondering how long it would take for the poor idiots to figure out they'd been had. If well-executed, the dupes would also be pretty well lost, since they were led deep into the woods in a completely unfamiliar area -- meaning it could take hours for them to make their way back to base camp. Anyway, Greg and I heard buzz about this "snipe hunt" for the entire day leading up to it. We were told how delicious ("like chicken") they were, and how much fun it was to bag them. I'm not sure about Greg, but I was genuinely suspicious right from the start. I had never heard of such a bird, and couldn't quite believe that the presented method of hunting could actually work. As the time drew near and we headed out, something just didn't seem right. The other boys seemed to be having a hard time containing their giggles and glee, and seemed like they were trying a little too hard to sell us on the whole "snipe" thing. But for whatever reason, we decided to play along anyway and head out with them to the appointed hunting grounds. Sure enough, it was a long walk, deep into an obscure area of the woods. There Greg and I stood, bags in hand, and off went the other boys to "chase the snipes our way". I don't think we were there for even 30 seconds when I announced to Greg that we'd been had, just like I knew we would, and that we had better start back to camp so we didn't end up looking like idiots. He agreed, and so off we headed. At some point, we appeared to be making pretty good time, and the thought actually crossed our minds to try and beat the others back to camp. "Imagine," we thought, "the looks on their faces when they see us sitting there waiting for them." But unfortunately, we didn't know the quickest or most direct route back to camp, so eventually we had to abandon that plan. We did get back mere minutes after everyone else had arrived, and naturally told them that we knew there were never any snipes, and that we just played along for the fun of it. But at some level, there's just no saving face when you've been led out for a snipe hunt. So you laugh along with the others and shrug it off, and in some strange way, you're now a little closer to the mystical inner circle of camaraderie that only boys can share. If you've heard a lot of good sermons, or read a lot of witty short stories by good authors, you realize by now that this final paragraph is where I present the great life lesson behind my experiences -- the "moral of the story", if you will. And this particular story, about the snipe hunt, is no doubt chock-full of great possibilities in this regard. But you know what? I really don't have anything in mind here. Never did. No point to make; no great underlying truth. Just a story from a boyhood memory. Sometimes a snipe hunt really is just a snipe hunt. Jim has been pondering the subject of "fellowship" lately -- namely, how it fits (or doesn't fit) into the larger context of our church experience. I have mixed feelings about this and related subjects, but do have some thoughts I'll try to capture here. My feelings are "mixed" because I'm currently in the process of trying to settle on what "church" means, and what my part in it is. I'm aware of the whole "we are the Body of Christ" thing, and agree that it's bad to be separated from the Body, or to harm, neglect, or disrespect the corporate manifestation of Christ-followers currently on earth. When we start asking questions about what church is and isn't, those who are content with the more traditional models seem quick to point this out. For the last few months, my family* has chosen not to attend Sunday-morning church services. When I first became a Christian in the early 80's, it was my belief that the spiritual state of believers could be gaged pretty accurately based on their church attendance, or lack thereof. Those who were backslidden had no interest in being around Christians or church, so they would stop showing up, and eventually reports would surface that they had fully returned to their old lifestyle. At the risk of sounding like I'm trying to justify our decision not to attend Sunday morning services, I'll be honest here -- our spiritual state and relationships with other members of the Body of Christ are better now than ever before. That fact doesn't automatically mean that we can declare success, or start promoting our "church model" as being superior to the more traditional models. What has worked for us, for several years now, is basically the "small group" as our primary expression of church. We did this when we lived in California, and when we moved to Tennessee, we managed to get "plugged in" to the same scenario here. What I'm referring to is not a once-per-week meeting, or some sort of coerced or contrived program. We do meet weekly, to sing, pray, take Communion, study the Bible, and just generally converse and communicate. But what I'm really talking about is a group of believers who have decided to live lives fully committed to one another. We can admit our faults and sins, acknowledge who we really are and how we really feel about things, and know that the underlying commitment will not cease. We take meals to one another during sickness or family crisis, act as emergency babysitters, share personal possessions in common for one another's benefit, we get together for meals, parties and other social events, and we do various service projects and neighborhood outreach things together (sorry -- I'm sure somebody somewhere just yelled "Bingo!" after this paragraph). I don't mean to over-idealize this. It's messy, imperfect, and doesn't always function in a healthy or beneficial way. 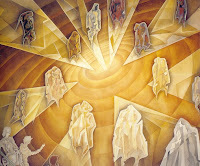 But I am being honest and transparent when I say that I believe every member of our group would agree that it's been tremendously beneficial overall, and certainly is the most intimate intersection between our individual, personal faith in Jesus and our need to share that faith experience with other believers. *My family means my wife and me. Our only child has moved out of the house, and it's possible that we might be making different choices in many areas of our life if we had children in our household right now.